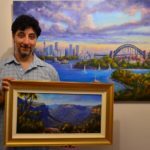 Join Christopher as he guides you through a relaxing morning of learning to paint a beautiful sunset sky in oil paints. You’ll be taught how to understand the use of color and how to develop a painting while also looking at composition, colour, tone, texture and edges. You’ll receive a brief introduction on oil painting, materials and methodology of oil painting, to get your familiar with everything in front of you! You’ll sketch, and paint, mix some colours, paint some more… and before you know it, you’ll have a gorgeous sunset painting to hang in your home. Learn some mad skills with us!